Like many other nineteenth century homes in Pittsburgh, this Victorian era townhouse in the Friendship neighborhood had been modified over the years and, more recently, subdivided into a duplex, before the current owner purchased it. The original, turn-of-the-century character of the interior disappeared throughout many historically-insensitive remodelings. 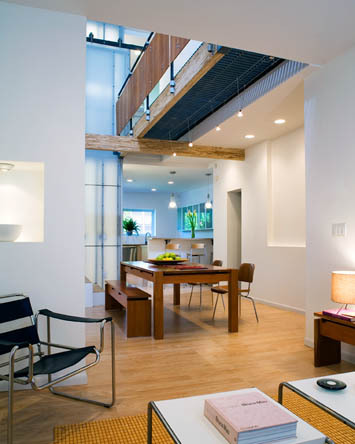 The new owner, a design professor at Carnegie Mellon University, wanted to return the house to being an owner-occupied, single-family residence. 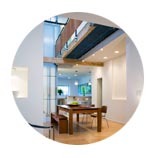 The design intent was to substantially modify the interior space of the home to allow for an abundance of natural daylighting and create a series of open spaces (kitchen, dining, living and open study) of the home. 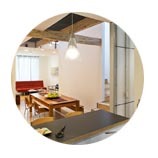 Because the historic interior had long since been removed, the new question raised became how does one change the spatial paradigm of the Victorian home which was about horizontal connections of rooms to a new spatial paradigm that is about vertical connection, transparency, and spatial overlap? 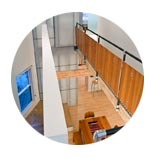 To accomplish the homeowner's vision of an open living space, an architectural solution was developed that employs a series of sliding door planes, open grid fiberglass grating, and translucent surfaces which allow the spatial depth of the interior spaces to be modified by the owner. 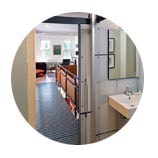 This provides for spatial flexibility and privacy when desired. 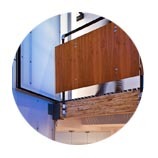 Many of the interior finishes were selected due to their recycled and sustainable material content such as parallel strand lumber, gypsum board, recycled plaster and bamboo flooring.